Cough is very frustrating and terribly uncomfortable both physically and emotionally. There are two types of cough – dry and wet cough. Dry cough is caused by allergens, dust and other irritants. Wet cough is caused when mucous or phlegm is developed in the throat. Commonly, everyone reaches out for over the counter cough syrups or tablets to treat cough. But do you know simple home remedies can provide the same effect as well? Yes, it’s true. A simple and easily available ingredient like ginger can show the same effect as commercial syrup. Is Ginger Really Effective for Cough? Ginger contains anti-inflammatory and antimicrobial properties which kills the bacteria. It helps to loosen the congestion developed in the respiratory passages. The gingerol and zingiberene present it boost your immune system. It coats the esophagus to prevent itchiness and irritation. It soothes the throat and reduces the reflex that develops urge to cough. 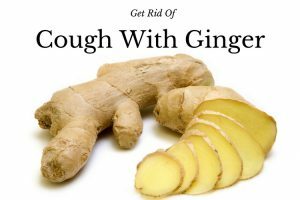 How to Use Ginger for Cough? Choose of the remedies and try them to treat the persistent cough. Make sure not to drink water for 30 minutes after trying the remedy. This gives ginger enough amount of time to act on the cough. Chew some fresh and raw ginger pieces. Bring a cup of water to boil and add grated ginger to it. Let the mixture cool down until lukewarm. Squeeze lemon juice and consume it. Combine 1/4 teaspoon each of cayenne pepper and ground ginger, 1 tablespoon of apple cider vinegar, 2 tablespoons of water and 1 tablespoon honey. For added benefits, 1/4 teaspoon ground garlic. Using a mortar and pestle, crush 10 – 15 tulsi leaves. Grate and extract juice from 1 inch ginger. Mix crushed tulsi leaves, ginger juice and honey. Combine ginger juice, a pinch each of pepper powder and turmeric and honey. Mix well and lick the mixture slowly for 10 minutes. Honey soothes the respiratory tract and fights off the bacteria causing cough. Extract juice from 1 inch root ginger. Combine ginger juice and 1 teaspoon honey. Consume this daily 3 times. Note: Don’t drink water for 30 minutes after consuming this mixture. Thyme treats respiratory infections, boosts immune systems and provides relief from cough. Slice a lemon into thin slices. Place the sliced lemons in a mason jar. Pour 3/4 cup honey into it and set aside. In a saucepan, add 2 cups water, handful thyme and sliced ginger (1 inch). Bring the mixture to boil and simmer until it reduces to half of the quantity. Strain the juice into the jar with honey and lemons. Stir well and store in refrigerator for 3 weeks. Consume a tablespoon three times a day. Peel and slice garlic, ginger and onion as thinly as possible. Layer the slices about an inch thick on the bottom of a mason jar. Pour dehydrated cane juice until the slices are not visible. Add another layer of the slices and add dehydrated cane juice. Repeat the process until the jar is almost full. Close the lid tightly and set aside for 4 hours. This mixture can be refrigerated and stored up to 4 – months. Consume 1 tablespoon of the mixture 3 times a day whenever you want to soothe the throat and reduce the cough. Pineapple contains bromelain (natural anti-inflammatory) which is proven to control cough and mucus. Roughly chop pineapple including the core. Using a blender, blend the chopped pineapple, chopped ginger (2 inches), 1 tablespoon honey, 1/2 teaspoon cayenne pepper and juice of 1 lemon. Strain the mixture to obtain fine syrup. Take 1 tablespoon of the mixture 3 times a day. Store the remaining mixture in refrigerator for future use. It stays up to a week. Peel and chop ginger into juliennes. In a saucepan, add 2 cups of water, 1 1/2 cup ginger juliennes and 3/4 cup of sugar. Bring the mixture to boil and simmer until the liquid is reduced to half. Whenever you are ready to use, strain the mixture into a 12 ounce glass jar. Top off the jar with sparkling water and squeeze lemon juice. In a saucepan, add 1/2 cup water, 1/2 teaspoon ground ginger, 1/4 teaspoon ground cloves, 1 tablespoon honey, 1 tablespoon fresh lemon juice and 1 cup evaporated cane juice (or granulated sugar). Bring the mixture to a boil and simmer until it reaches 300 °F. Remove from the flame and let the mixture cool down slightly. Meanwhile prepare a baking sheet by lining it with a parchment paper. Drop onto baking sheet into small rounds. Allow them to cool and remove and dust them with powdered sugar or corn starch. Place them in an air tight container to store them. Take one in the morning and another at night to get relief from cough. Cut 1/2 inch ginger into juliennes and add salt to it. Chew this mixture 2 times a day. To a saucepan, add 1/2 inch ginger, 5 peppercorns, one small green cardamom, one small piece cinnamon stick and a glass of water. Remove from the flame and strain. Let it cool down slightly and add 1 teaspoon honey. In a saucepan, add 1 cup jaggery and let it melt down. Now add 1 teaspoon dry ginger powder, 1 tablespoon clarified butter, 1/4 teaspoon black pepper, 1 teaspoon turmeric powder and a pinch of salt. Cook until you see bubbles coming out of the mixture. Make small balls out of the mixture and store in an airtight container. It stays edible until 10 days. For adults, take 3 balls a day. For kids 2 balls a day. In a saucepan, add 600ml of water and bring it to boil. Finely chop 3 big lemongrass buds and add it to boiling water. Now chop a 2 inches ginger root and add it to boiling water. Strain the mixture, add 1 teaspoon honey and drink it. Massage few drops of ginger oil on chest to get relief from cough. It is best to massage before going to bed to have a peaceful sleep. Avoid ginger if you are allergic to it. Gargle with salt water to get relief from the irritation caused by mucus and to prevent further infection. Avoid cold water and drink lukewarm water. If cough is persistent even if you tried above remedies, consult a doctor. Drink soups to feel better. Keep yourself warm during the winters. Add ginger in your daily diet to strengthen the immune system. We hope the article has helped you. Do you have any other remedy that works wonders on cough? Write to us in the comments section below.